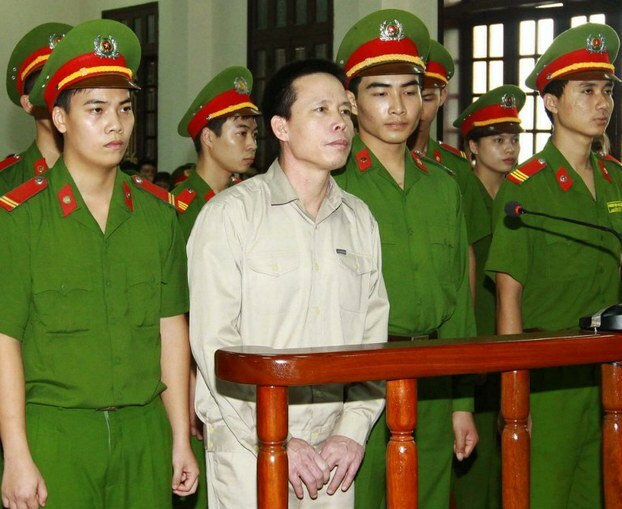 A court in northern Vietnam on Friday sentenced a former soldier-turned farmer and his family members up to five years in prison for putting up an armed fight against security forces who evicted them from their farm in a case highlighting public resentment over government land grabs. The Hai Phong People’s Court delivered unexpectedly “lenient” sentences to fish farmer Doan Van Vuon, his two brothers and a nephew, who used landmines and homemade shotguns to ward off authorities sent to repossess their farm in January 2012. They faced attempted murder charges after four policemen and two soldiers suffered serious injuries during the clash. According to Vietnamese law, a conviction of attempted murder carries a minimum sentence of 12 years in prison and a maximum of the death penalty. Instead, Vuon, 50, received a five-year jail term along with his brother Doan Van Quy, while a third brother Doan Van Sinh received 3 ½ years and Sinh’s son Doan Van Ve was handed a two-year sentence.